House of Adolphe Sax. Adolphe Sax was born in Dinant in 1814. 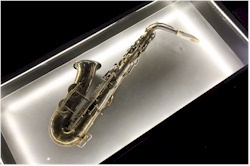 He was a musical inventor and his most important creation was the saxophone. The most famous son of Dinant is being honored with art that is placed on different spots throughout the town. On the spot where his birthplace was, a house has been arranged as a museum that gives an overview of the life and the accomplishments of Adolphe Sax. House of the Pataphony. The house of the Pataphony is dedicated to sounds because by combining tones you lay the base of music. In the interactive house, people of all ages can experiment in a pleasant way with original and sometimes very strange objects and instruments to create their own symphony. Museum Citadel of Dinant. The place where the town of Dinant is located has always been a place of strategic importance; therefore it shouldn't be a surprise to know that on the spot of the current citadel, there already used to be a castle in the 11th century. In its present form, the citadel only dates back to 1821, when it was constructed by the Dutch. 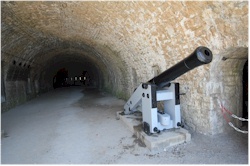 The citadel can be visited and hosts a museum inside. On top of that, you have a great panoramic view on the town and the Meuse that are located at its feet [more information].